2. Stand alone SQL Servers on SAN Disk (changing sans). The most important thing to remember is to backup. The next most important thing, no matter what the SAN Engineers, Windows Engineers or Vendors tell you about SAN Migration, YOU AS THE DBA ARE RESPONSIBLE. Understand the migration plan for each scenario, regardless of what anyone says, the DBA is always left holding the bag. If you don't understand the migration plan / scenario, make them explain it, learn it, try and practice it. I'll explain with an example. One of the important items in most scenarios is updating to latest drivers and versions of software, even this step can be dangerous. In a recent effort to patch servers to the latest version of drivers the SAN disk just "disappeared", when it came back, there was NO DATA. No amount of research could yield what happenned to the data. Refer back to the most important thing! All of the different scenarios are simple, with careful preperation and a good windows and SAN team. 1. Stand alone SQL Servers instance on Internal Disk to SAN. Usually the most difficult thing here is that you are taking an existing stable server and adding a lot of new complexity to it. Drivers and hardware for the SAN, sometimes this does not always go well, if possible I try and get new hardware and completely swap the machines, configuring the new machine in advance for the SAN and installing sql; taking several dry runs to ensure it's stable. The next issue is the down time in copying the data from the internal disk to the san. Than switch the drive letters and start SQL. Don't forget the most important thing. Here is where having a good windows and san team can help you. Most of the migrations I've been involved with the Windows and SAN team will setup a mirror between the SANS. Than on migration day we stop SQL Server, the windows and san team ensure the mirror is up to date, than split the mirror and hook the server up to the new storage and ensure the drive letters and mount points come up. SQL DBA restarts sql, boom, your done. Sometimes if your switching san vendors, you can't setup a mirror. Now things get dicey. Can you get "hooked" up to both sans simultaneously, of so than your ok, stop sql, copy the data to the new san, reset drive letters and mount points, restart SQL. If you can not get "hooked" up to both sans simultaneously than you need to default to some type of backup and restore mechanism, tapes or copying sql files to local disk (if you have room). I'm usually not a fan of this, as I find that different vendors use different drivers, switching vendors means now you have both vendors drivers on the machine, the machine decays and becomes unstable, NOT FUN. Don't forget the most important thing. 3. VM Ware SQL Servers (required to be on SAN). These have been my easiest san migrations. That's because we have awesome dedicated VM Ware administrators. They do it all, just schedule the outage. But trust me, Don't forget the most important thing, check your backups went to tape, double check your Disaster Recovery plan. I've only done Microsoft Cluster migrations with SAN Mirrors, and it has been uneventful. This is because the "mirrors" end result is the preservation of clustered resources (quorum), drive letters etc. But don't forget the most important thing. Again a great windows and san team makes this easier. I'd fret to switch vendors on the Clusters, but if I ever do I'll update this post. This is the SAN Migration worst case scenario, "The clustered file system". Below are the steps we followed for migrating sans with Polyserve. Don't forget the most important thing. Administring the advanced SAN technologies is different for each vendor and quite proprietary. You definetly want to test and work with each one individually and ensure it all works. The details of this are far outside the scope of a simple blog post, but having great SAN engineers will make this easy, as they generally setup the mirrors, clones and movement of them to different machines or remote locations. Ok, for whatever reason we compress the XML Blobs we store in the database. This created the problem for me to view the data, as the DBA is always asked to go find this record in the XML. I ended up creating a little windows form application in VS2005, using C# that can decompress the blobs so I can view the data. I also added a peice that shows how to compress the blobs and save them to a database. 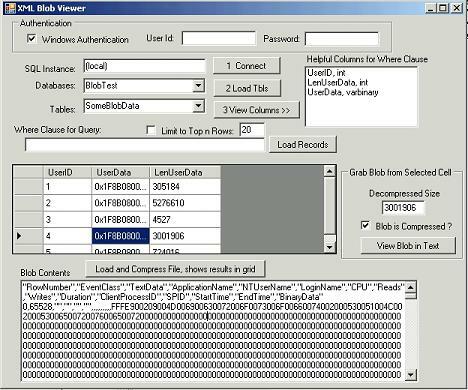 There was also a fun peice about displaying byte data in datagridview, it's in there! I've also created a sample database with one table and a few records that are compressed, it's a sql server backup file, or you'd have to modify the code to create a table with some compressed blobs to see it work. This was a just a fun thing to do, we get a lot of mileage out of compressing the XML data. This post may raise more questions for you than it answers, but it really is something that happenned in my shop and confused some people. So I'm creating this post as a place holder so I'll be able to reference this 10 months from now when the same issue comes up and I've forgetten the solution. Thanks to Tom Reeves from our team. 7) Click the Create button on the Destination tab and copy the code from the window. You can hit cancel on this screen now. 8) Open one of the Execute SQL Tasks and set the connection manager to the Excel connection and type your Drop sql statement. 8) Open the other Execute SQL Task and set the connection manager to the Excel connection and type your Create sql statement.